The cover is now showing up on the product page, so I’m very happy to be able to list the store links at the end of this post. 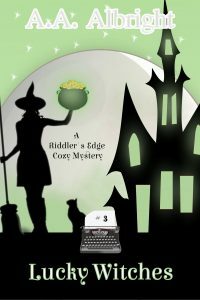 Just because Detective Quinn is on holiday does not mean that the rest of Riddler’s Edge gets to take a break. And it definitely doesn’t mean that Aisling misses him. But even if she did miss him – ever so slightly, mind you – she has far more urgent things to worry about. Like the fact that every single person the detective asked to look after his lighthouse has met with an unfortunate accident. Or the fact that a mysterious casino has appeared overnight – and instead of winning money, the gamblers are winning wishes. Some of you might have noticed that Lucky Witches has already been released. If so, you might be wondering why I haven’t yet posted here to let you know. Well, there is a reason, and it’s not even remotely frustrating. Ahem. The book was published on June 27th. But for some reason, the cover seems to have gotten lost in Amazon Glitch Limbo Land. The book and its cover were both uploaded, and the book is live and available to purchase except that if you do … I don’t know if you’re going to get a cover with it. I don’t know the reason for the glitch. It hasn’t been explained to me by Amazon. All I know is that the problem is on their end, and there’s nothing I can do except wait for them to fix it. I can’t even tell you if the cover is simply missing from the store, or if it will also be missing if you download it. I haven’t received detailed information. B: Thinking that I’ve been dumb enough to upload a book with no cover, and have therefore lost all faith in me as a writer and a human being. I’ll post store links to the book as soon as Amazon have correctly added the cover.